Today, we are studying the Nishinomiya Bridge between the cities of Osaka and Kobe. As you can see, some of the concrete hammer-head piers were shattered during the Kobe earthquake. Apparently, there was not enough transverse reinforcement, although the near fault ground motion would have damaged most structures. It's a continuous, six-span steel, box girder bridge with haunched girders. 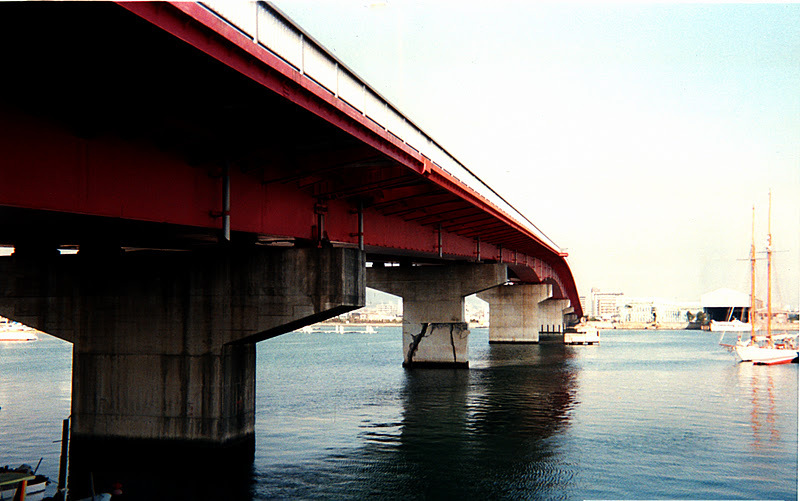 Osaka Bay Bridges: Nishinomiya Harbor Bridge by Mark Yashinsky is licensed under a Creative Commons Attribution-NonCommercial-ShareAlike 3.0 United States License.